Eggs! Also anything high in healthy fats – salmon, almond butter, olives, cheese and coconut oil particular favourites. Not all at once though!! Neville Southall and, more recently, Billy Monger. The latter should be an inspiration to all in terms of never giving up and following your dream. Sani Resort in Halkidiki – brilliant for families and adults. I thoroughly recommend it! Managing a local football team (for my sins!) and raising awareness for Williams Syndrome – a condition my gorgeous daughter, Eva, has. Please visit http://www.williams-syndrome.org.uk/ for more info! Can I say Ale or Sauvingon Blanc?!? If not, then lager – gone are the days of me being able to drink (and manage) Cider haha! Bacon Sandwich or Kale Smoothie? Heights – even seeing pics from high up looking down make me shudder! I love spiders though…. I couldn’t live without my? Whats your favourite thing to train? It used to be back due to being my strongest area, but I now love shoulders due to the variety of exercises you can do. Lunges. I’ve no balance and it’s legs! When I’m not working away you’ll find me in the Armoury at 6am! Ideally I like to train 5 days a week and also play football 2-3 times a week. Whats likely to be on your earphones whilst you’re at the gym? Quite an eclectic mix ranging from house music, rap, R&B, rock and 70’s/80’s classics. 70’s funky disco is probably my favourite and could be why I own 20+ floral shirts! To be in the best shape I’ve ever been in by the end of this year – my 40th on this earth! The goal is a little way off at the moment! Having previously worked in health and fitness for 13 years, it’s seeing different people all working towards (and enjoying it) their individual goals – helped by a great coaches/trainers. Something which is in abundance at the Armoury. What’s your biggest bug bear when in a gym? What would you say to anyone thinking about joining the gym? It’s a huge step for lots of people and, having worked with many in this situation, a scary prospect if you’ve not trained in that environment or at all before. However, if you’re thinking of joining, you can rest assured that everyone, of all shapes and sizes, are there to achieve the same thing as you – a personal fitness goal. 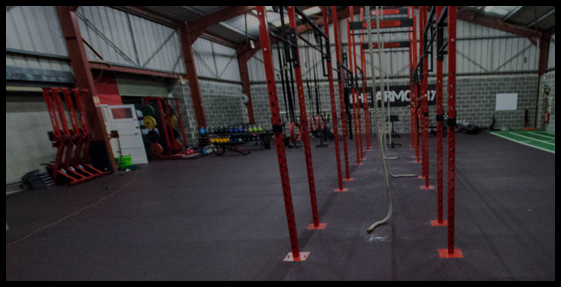 With regards to the Armoury, it’s made a more welcoming place than many gyms in that it’s developed into a community and support network for everyone attending the gym regardless of fitness levels.